Robin Horton talks about the use of lasers in implant dentistry in three case studies that demonstrate how powerful dental lasers can be when treating implants. Robin qualified from the Royal London Hospital in 1990 and went straight into general practice. For the first few years after qualification, he also worked at Bedford Hospital as an SHO in its oral surgery department where he learnt many of the surgical skills he still uses today. 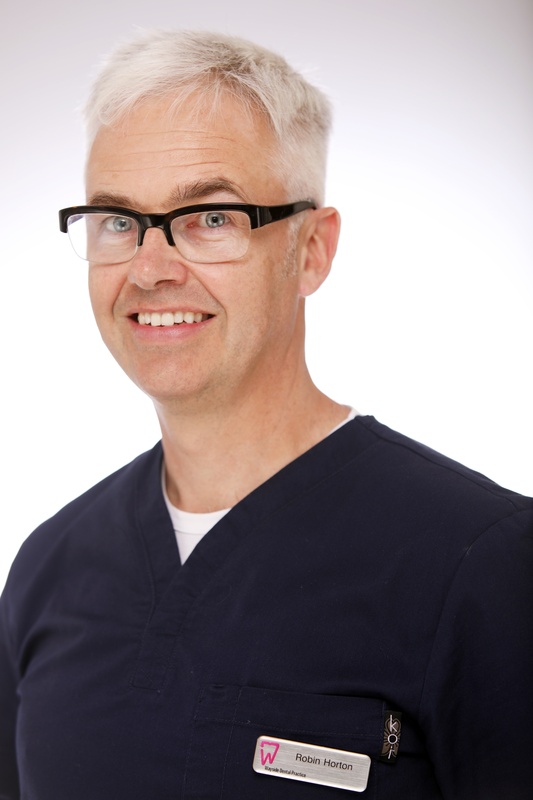 Robin has always been interested in technological advances in dentistry and he was one of the first dentists in the UK to practice laser dentistry. Robin started placing implants over 10 years ago and has placed around 2000. He started doing guided surgery for some cases about 2 years ago, but now uses guided surgery for almost all his cases. He has placed over 250 using guided surgery. Here, Robin Horton presents three case studies demonstrating the use of lasers in implant dentistry. I have been a laser user since 2001, starting with a diode laser for soft tissue work. I then became aware of the use of water lasers in non-surgical crown lengthening. I was fortunate at this time to see Hugh Flax’s presentation on this subject and spoke to him at length. His passion affected me and we bought two for our practice immediately and never looked back. We now have three water lasers and two diode lasers in the practice. The process of non-surgical crown lengthening involves soft and hard tissue removal in a very precise and controlled way and really showed me the versatility of the Waterlase in one procedure. In comparison to the very messy and almost cruel surgical procedure, which is like something from medieval times, the Waterlase is simple, highly effective and very patient-friendly. In fact if lasers were banned tomorrow I would give up dentistry. I use lasers every day in all facets of my work. It makes dentistry faster, more efficient, cleaner and so much more fun. With practice it is possible to tackle many procedures that might be otherwise referred out of the practice. It is so much simpler to do a frenectomy or a tongue tie with a laser than a scalpel. As well as being easier, the healing is faster than if using conventional treatment. There is almost no post-operative pain, swelling is much reduced and post-operative infection incidence is lower too. This has a bearing on post-surgical margins and provides more predictability and better aesthetics. Lasers can be used pre-op in the extraction process, for removing soft tissue to enable visibility of the roots, to section the roots and as a periotome. A laser is a very good tool for bone remodelling, socket debridement and decortication, and socket preservation. Of course, they can also remove inflamed and infected junctional epithelium. I use my laser to help in preparation during the implant procedure, for decorticating the socket and then later on when sculpting the emergence profile and at post-operative recall in photo bio modulation to help with the bony remodelling (laser sculpting) (Diagram A). The benefits of laser use are, ease of extraction, superb vision of site, pin point accuracy, neatness of operation, predictable healing, minimal pain and swelling, often flapless especially in conjunction with guided surgery. I rarely need to use dexamethasone or antibiotics and experience very few failures. Lasers are ideal for soft tissue control, giving the benefits of fast healing and highly aesthetic results. Excellent sculpting capabilities enables the creation of good emergence profiles (Diagram B). In the cases here I have concentrated on implants but lasers are also very useful in periodontics and endodontics and of course in conservative treatments. For me lasers bring back excitement and a sense of fun into dentistry, meaning you can take on procedures that would be very difficult without a laser. Here we see the emergence profile created using a laser and then an impression taken of that profile in the soft tissue using a modified impression post to maintain the soft tissue shape at impression so the crown can be a ‘natural shape as it emerges from the gingivae (Figures 1 to 6). Figure 3: CBCT scan of the same tooth pre xla. Note both the loss of the labial plate in some areas and also just how thin the labial plate is. It is obvious from this view just how fragile this area is and why, once lost, it is so hard to regain. There is nothing to graft to once it has gone. Lasers are one way of giving us an ‘edge’ here in the healing process. Here we see a complex multidisciplinary case, involving months of occlusal correction, removal of hopeless teeth, placement of implants, crowns and veneers (and a Michigan splint). Change of lifestyle to aid prevention was required and a laser was used at every stage. This enabled me to keep soft tissues and resulted in a natural look (Figures 7 to 13). As you can see splinting would not really have helped. Figures 14 and 15: This ongoing case illustrates the need for 3D imaging in implant cases. The first practitioner presented with this case was going to splint it and save it. Hockey ball to face – no mouthguard. Figure 16: This slide shows the remnants removed, using a laser as a periotome. Socket preserved as far as possible, it was blown out buccally. We placed an immediate implant, a graft and a membrane and used a Maryland bridge as a temp. Book your place on The Magic of Lasers in Implant Dentistry with Robin Horton - a one day hands-on CPD dental laser course, focusing specifically on implant dentistry. Just £390+ VAT on 16/03/2019 - For more information & Booking - Click here!